Former Obama National Security Adviser Tom Donilon on "This Week"
A rush transcript of "This Week with George Stephanopoulos" airing on Sunday morning, December 1, 2013 on ABC News is below. This copy may not be in its final form and may be updated. BARACK OBAMA, PRESIDENT OF THE UNITED STATES: The website is continually working better, so check it out. STEPHANOPOULOS: Today is the day for the heal care website. Is it mission accomplished? Or is Obamacare beyond repair? All the breaking details, debate and analysis, plus the political fallout with our powerhouse roundtable. Then, battle of wills. The U.S. faces new tests with China, Afghanistan and Iran. Can America prevail? How will the president manage these multiple crises? An exclusive look at Obama's strategy from the man who was there from the start. UNIDENTIFIED MALE: Helmet goes flying. STEPHANOPOULOS: But on this Thanksgiving weekend, new questions about the dangers -- should you let your kids play? BONO, SINGER: There's a chance to have an AIDS-free generation. We can see it. STEPHANOPOULOS: On this 25th World AIDS Day our exclusive interview. All that right here on this Sunday morning. STEPHANOPOULOS: Good morning. I hope you all had a great Thanksgiving. We have a lot to get to this morning starting with that deadline for Obamacare. Hard to imagine a more shaky launch. We're even learning now that at one point the White House considered scrapping the site and starting all over again. But in a brand-new report released this morning, the White House now says the website is meeting its goals, working smoothly for the vast majority of users. ABC's Rebecca Jarvis is tracking the story. She has all the latest right now. Good morning, Rebecca. REBECCA JARVIS, ABC NEWS CORRESPONDENT: Hi, George. Good morning. And this is the eight-page report. It says that they have now fixed 400 bugs in the system since the launch, 9 percent -- more than 90 percent of the time it's working, it's stable and they believe at any given moment in time, 50,000 users can access the system, that would equate to about 800,000 users a day. What's still unclear from this report, is what happens if it's a bigger number, if it's 250,000 users at a given moment in time, that's where things stood when the website initially launched and had all of those issues. STEPHANOPOULOS: But we also learned this week, Rebecca, of another delay in part of the program. JARVIS: Yes. The delay is on the business side, the small business side. As far as small businesses go, they won't be able to access and get insurance through healthcare.gov for at least another year. And as far as that business mandate goes, for small employers, employee 50 employees or fewer, they will now have their mandate delayed for a year, but that individual mandate remains in place if you sign up for health care through the exchange by December 23rd, you should be covered by January 1st. STEPHANOPOULOS: White House holding the line on that individual mandate. Also spoke with the White House official yesterday who said that the enrollment numbers for November are going to come in much stronger than October, the question is going to be is it good enough? JARVIS: And that is the question, because At the current rate, the rate that we know that this website is running at, if they want to get 7 million people signed up, it will fall short of that number. We're looking at about 1 million at the current rate signed up in the amount of time that they were expecting. And that could mean for future issues as far as the mandate is concerned for people and the cost of their insurance, the pools -- if the pools are primarily dominated by older, sicker members, than ultimately those premiums will go up in 2015. STEPHANOPOULOS: OK, Rebecca Jarvis, thanks very much. Let's bring in two key members of congress, Republican Tom Cole of Oklahoma, Democrat Keith Ellison of Minnesota. They're here along with Peggy Noonan from the Wall Street Journal, David Plouffe former top adviser to President Obama and now an analyst with ABC News and Bloomberg. And Peggy, let me begin with you, we heard those numbers from the White House right now. The question is, are people really going to believe it and are they then going to get engage with that website now? NOONAN: Yeah, that's a great question. A funny thing in life is that even programs can get reputations. You can get a sense that something isn't working. I think the Obamacare problem is two-tier. One is the real problem with the website that has been fascinating and captivating people for two months. Beyond that, there is the deeper problem of America discovering of what is in the program itself, people losing coverage, the doctor situation -- you can't keep them, et cetera, et cetera, et cetera. Plus, there's something new, orphaned policies, in which people go on to the site, think they have registered and find out in January that they haven't. So it's so problematic that I have said since October, this thing should just be delayed one year. STEPHANOPOULOS: And David, picking up one of the points that Peggy said, there's so much focus on the problems, you have this political danger that people pocket (inaudible) and then just focus on what are the dangers going forward. PLOUFFE: And there are a lot of benefits -- seniors saving on prescription drugs, preventive care being covered for women, in particular, people getting rebates from insurance companies. But there is a huge interest out there. And I think we ought to fast-forward a few months here. This has been a rough period, obviously. STEPHANOPOULOS: Only if there's a rapid increase in the enrollments. PLOUFFE: But you see the interest out there, George, people want health care. They're going to be able to get health care. So, if the website is working -- and to your question, we live in a very social world now, people will tell their siblings or they'll talk their brothers, or sisters or their friends, say I went on, it was pretty easy, I got health care. I'm happy with the plan. So, this is going to be something that person to person is going to get fixed or not. And I think what you're beginning to see is the interest is spiking, because the interest is out there. People just need an easy experience and it hasn't been easy. STEPHANOPOULOS: How about that point, Congressman Cole? I think David is right, people are flooding that website. COLE: Well look, you never get a second chance to make a first impression and the first impression here was terrible. And I think it's going to be an unfolding disaster for the president. There are going to be some winners, there's no question about that, but there are going to be millions of losers, too. People are going to find their rates going up, people that have insurance they like are going to be losing it. It's one of the reasons for the postponement of the business mandate. You know, the individual market is pretty tiny compared to what's yet to come. And I think as that unfolds, this thing is going to be an unmitigated political disaster for the president. STEPHANOPOULOS: And will Democrats hold the line and continue to support (inaudible)? ELLISON: I certainly believe so. I mean, the fact is that we have had health care nightmares for the last years, decades, and how people were going bankrupt and how they couldn't get covered and how they were being dropped. We're getting to a point where, yes there are a few problems we're working through now, but we can see the end of that era and to a new time when people will be able to get sick and get care and not worry about being dropped and not worrying about going bankrupt. STEPHANOPOULOS: But you identified one of the problems right there. You're right, there have been problems with health care since as long as there has been health care. So now the government and the president are going to get blamed for every problem. ELLISON: But I'm going to tell you this, I would rather have our hands in -- than the naysayers. And the reason why, this website is technology. It's going to get better. It's already better today. And we're only going to be working out more kinks as we go forward. And if you look at the history here, you know, Republicans and conservatives, they said Social Security was socialism, Medicare was socialism and all of this kind of proclamations of doom, when now they are mainstream core programs. STEPHANOPOULOS: And Peggy Noonan, one of the things you do see, even more Republican governs signing up accepting the program especially on Medicaid. We just saw Michigan signing up on top of Ohio and New Jersey, some big states there. NOONAN: Yes. And lots of people will be making decisions based on money and the agreement they can get with the federal government. But let me say something so old-fashioned, I always thought one of the central mistakes here was obsessing on the issue of insurance and not obsessing on the issue of health care and making sure everybody who gets into an accident, who has some trouble, who doesn't have money, can get treated in America. It seems to me, we had some programs that could be deepened, broadened, made good, made better. And insurance is complicated. And we are seeing in this whole website thing and in everything that follows, you can't control that market. It's a big, complicated, nutty, messy market. We shouldn't have government even have gone in there. NOONAN: Happy Thanksgiving to you fellows. ELLISON: I'm going to tell you right now, I would support Medicare for all. I was ecstatic when we proposed Medicare go down (inaudible). But, you know, here's the problem. And you've got to deal with the system that you have. And there was so much fear, resistance, anxiety around moving to what I think would be the real problem, a real solution that people just -- we ended up with a tiebreak. NOONAN: Éfor a bunch of voodoo from business guys. ELLISON: It's a good idea. NOONAN: Éwaste and fraud and abuse. Show that regard for these systems and then broaden them. PLOUFFE: This program was designed to be implemented by the states. And in most of the states (inaudible) is going quite well. You talked about Medicaid expansion. I think it's just a fact, and it may take until 2017 when this president leaves office, you're going to see almost every state in this country running their own exchanges eventually and expanding Medicaid. And I think it'll work really well, then. STEPHANOPOULOS: That's 2017. And it's also a fact right now, David Plouffe, that the public seems to have lost confidence in President Obama, both his confidence, and for the first time in -- whether he's honest and trustworthy. How does the president turn it around right now? If you were back in the White House right now you'd be planning that State of the Union coming around in January. What are the keys to rebuilding his profile and his agenda? PLOUFFE: Well, this has been tough patch. And it's not just health care. You know, the shutdown affected everybody's confidence in government. But I think -- let's fastforward to the State of the Union and the months ahead. Health care working better, a lot of people signing up, the economy continuing to strengthen, hopefully no Washington shutdowns. I think the president's numbers will recover. I think people's confidence will recover. And then we need to push congress to do immigration, to do smart things to help the economy. That's -- the American people are sitting at home and saying we're talking about all these issues except what's most important to me, which is my job and which is my income. And that's what Washington needs to focus on. The American people are screaming out, focus on us, what's important to us. NOONAN: David, I think the president has a problem. This is what it is, it's simple. He said if you like your health insurance policy, you can keep it. Period. If you like your doctor, you can keep him. Period. If you like the hospital you go to, you keep it. Period. That has all turned out in the past two months as Americans have interfaced with this program to be untrue. And the American people look at the president and they think, he's no dummy, he's a really smart guy, and because he's a smart guy, they think, well, that means he deliberately misled us to get his program through. People don't like that. That's another reputation changer, and I think that's problematic for the president going forward in the next few months and years. PLOUFFE: I think he spoke directly to this, and I think people accepted what he had to say. I think people trust this president. I think there have been numbers all over the place, but I'm confident in a few months from now, those trust numbers are going to come up. I think his approval number will come up. And I think more than anything else, as we begin to focus hopefully on what really matters to people. And that's what the president I think needs to do, and he is trying to do it this week. STEPHANOPOULOS: Let me bring that to Congressman Cole, especially the issue of immigration. You saw the president go out to visit some protesters on the mall this week saying he hasn't given up on Speaker Boehner. COLE: Well, Speaker Boehner hasn't give up on him, but let's just say they're awfully disappointed in one another. STEPHANOPOULOS: But on the issue particularly of immigration, any hope for that this year? STEPHANOPOULOS: Do you think it's possible again? COLE: I don't think it's likely, but look, we stumbled into one before that I didn't think was wise and didn't think should occur. The line I usually use is, you know, around here, we can't walk and chew gum. Let's just chew gum for a little while. And right now, chewing gum is getting a budget deal and making sure that we don't default when the debt ceiling comes around. ELLISON: You know, I just want to say that I think that everything that the president said and did was in pursuit of trying to get Americans, all Americans health care. So I think even though he may have said, if you like your decent insurance, your insurance that works, then you can keep it, I think that people really get that. When -- he owned it. He said, look, man, if you misunderstood what I was trying to say, I'm sorry about that. I think that shows integrity. He didn't do anything to self-promote. He did -- what he was doing he was trying to do -- to help Americans all over this country for decades. COLE: -- with Keith. We knew back in 2009, 2010, this was going to happen. The Congressional Budget Office put out studies about it. We made the points, and we know now the administration had plenty of documents. COLE: -- were going to lose health care here. So I think this does get to credibility as well as competence. ELLISON: These plans actually, many of these, these high-deductible, high-exclusion plans, they don't -- they were not quality plans in many cases. And the fact is, they were for a small -- they might work for somebody who had a lot of money saved up, but for other folks, they just didn't. There's a reason those premiums were low. STEPHANOPOULOS: I'm going to ask you all to stand by. We're going to come back for more roundtable later, but we're going to turn now to national security. It's a week of showdowns and tough diplomacy. The world's biggest power, America's longest war, and that emerging nuclear deal with Iran all front and center. 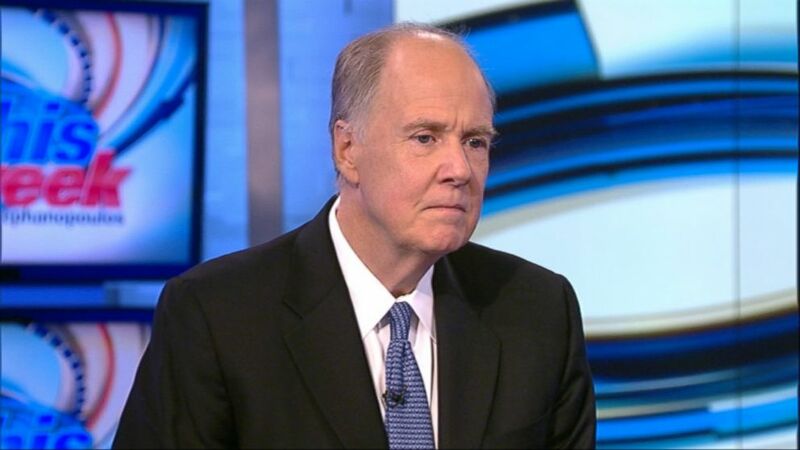 We have an exclusive interview with President Obama's former national security adviser, Tom Donilon, coming up. But first here's some background from ABC's Muhammad Lila. MUHAMMAD LILA, ABC NEWS CORRESPONDENT: One week changes it all. Last Sunday, news of a historic dial, U.S. and Iranian negotiators triumphantly returning home. UNIDENTIFIED MALE: I think this is absolutely a win for both of us, for Iranians and for the other countries. LILA: In the streets of Tehran, we found signs of hope everywhere, from skateboarders who want Americans to visit. UNIDENTIFIED MALE: I hope the relation gets better. LILA: To teenagers hanging out at a fried chicken joint. Raise your hand if you think you have freedom here in Iran. LILA: But this week, it's back to reality. Saudi Arabia, America's longtime ally is nervous about the new deal. And Israel is sending teams to Washington to lobby against it. All of this forcing Secretary Kerry to try reassuring Congress and those allies overseas the deal is narrow. JOHN KERRY, SECRETARY OF STATE: So believe me when I say this relief is limited and reversible, I mean it. LILA: And in neighboring Afghanistan, another foreign policy headache. The standoff between President Karzai and President Obama continues despite a diplomatic full-court press. After 12 years and more than 2,000 American troops killed, Karzai is refusing to sign a long-term security deal with the United States. A drone strike this week that reportedly killed a young Afghan boy only making tensions worse. If the deal isn't signed, America says it will pull all of its troops out next year. Meanwhile, off the coast of Japan, it's a symbolic fight. Take a look at this map. It's what China calls its new air defense zone. The Chinese announced any aircraft that want to fly through it need permission, even though the area covers two islands Japan says it owns. It's prompted this warning from America's new ambassador to Japan, Caroline Kennedy. CAROLINE KENNEDY, AMBASSADOR TO JAPAN: Unilateral actions, like those taken by China, undermine security, and constitute an attempt to change the status quo in East China Sea. LILA: And, George, when two American B-52 bombers entered that air space this week, how did the Chinese respond? They scrambled their own fighter jets to tail them. So in this case, the tension really is sky-high. George? STEPHANOPOULOS: Muhammad, thank you very much. Let's bring in Tom Donilon now. Up until August, he was President Obama's national security adviser, here for his first Sunday interview since leaving that post. Welcome to This Week, Tom. Let's begin with that cat and mouse game going on in China. I think a lot of people look at that and say, why should we care so much about a couple of uninhabited islands in the East China Sea? TOM DONILON, FORMER NATIONAL SECURITY ADVISER: What we should care about are actions which raise tensions in northeast Asia. You have obviously major powers there, China, Korea and Japan. China has unilaterally undertaken a set of steps here which instead of lowering tensions, increase tensions. And most importantly, George, they really do present the prospect of the possibility of miscalculation and mistake. Remember, in 2001, we had an incident where you had a Chinese fighter pilot killed on a collision with a U.S. plane that had to land in China. And it's that risk of miscalculation and mistake that we need to be very concerned about going forward here. STEPHANOPOULOS: In some ways, you saw something like this coming when you were the president's national security adviser. You really put a lot of energy, a lot of time and your personal time into this so-called pivot to Asia. Should Americans get used to the idea now that China really is our No. 1 rival in the world? DONILON: I'd look at this way, is that Asia is a principal opportunity for the United States and the world going forward. Our prospects and Asia's prospects are linked. It's the fastest growing economic area in the world. And it's a tremendous opportunity there. Secondly, for 60 years, the United States has provided a security platform on which Asia's socioeconomic development has been built. It's a critical role for the United States and it's one we should play going forward. And indeed, our decision at the outset of the Obama administration was that we should put more effort into this, to provide (ph) additional effort and security in the region in order to allow it to go forth. Because let's do a thought experiment, do a thought experiment, just in this current incident. If the United States were not present, if the United States didn't take the actions that it's taken in terms of consulting and coordinating -- coordinating with our allies, having Vice President Biden go talk to the Chinese about it. DONILON: Leaving today. You could see tensions rising to a really dangerous level. This has been a long-time role for the United States. And it's one that we should continue to play and intensify going forward. STEPHANOPOULOS: And it seems like the more the president and you try to make this pivot to Asia, you're always getting drawn back into the commitments we already have, including Afghanistan, and it's back in the news this week. We saw your successor, Susan Rice, go over to Afghanistan, meet with President Karzai, trying to get this long-term security pact signed, yet he says now he's not going to do it, raises new demands to the United States. And again, I think the instinctive reaction of a lot of people is, fine, if he doesn't want to sign the security pact, we'll bring home our final (inaudible) troops. We don't need to be there if we are not wanted. DONILON: President Karzai should go ahead and sign the agreement. As you and I sit here this morning, George, the United States has 51,000 troops in Afghanistan. It's not on the front pages of the newspaper the way it had been in the past, but 51,000 troops. STEPHANOPOULOS: The casualties are way down, though. DONILON: Casualties are way down, and we're in the process of withdrawing from Afghanistan, and we hope that we will complete that mission by the end of December, 2014. What this discussion is about is whether or not there should be any support, any presence of U.S. troops after 2014 inside Afghanistan. STEPHANOPOULOS: So why should there be? DONILON: Well, for a couple of reasons. First of all, President Karzai should go ahead and sign the agreement. It's been approved by a very large assembly of leaders in Afghanistan. 2,500 leaders got together, looked at the proposed agreement with the United States, after December 31, 2014, and asked -- and recommended to President Karzai that he sign it. president Karzai should sign it, because I think it's in Afghanistan's interests, and I think it's in our interest. That said, his refusal to sign at this point I think is reckless. I think it's reckless in terms of Afghanistan, and I think it also adversely impacts our ability to plan coherently and comprehensively for post-2014. STEPHANOPOULOS: So does the U.S. mean it when it says, fine, if he doesn't sign it, we really will pull everyone out? DONILON: At some point, George, it becomes impossible to make those kind of plans. Right? (inaudible), if the United States doesn't have a bilateral security arrangement with Afghanistan that supports its troop presence there and provides the kinds of protections that we need, the United States cannot be present in Afghanistan after December 31st, 2014. And this has cascading effects. If the United States isn't there, NATO allies won't be there, because NATO allies rely on the capabilities that the United States provides. We won't have the same kind of support for the Afghan national security forces. And I think (inaudible) security systems as well. It's a very big point of -- point of decision here for the Afghans, for President Karzai. He should go ahead and sign the agreement, and if he does not, I think the United States will move towards the so-called option B, and by the way, the United States has a lot of options with respect to being able to pursue its interests. STEPHANOPOULOS: Could that cost all of the gains that have been made in this long war? DONILON: We think at the end of the day, it will be better to have continued support for the Afghan national forces and have a small counter-terrorism presence in Afghanistan. But again, as I said, the United States has a lot of options in terms of protecting its interests in the region. STEPHANOPOULOS: Let's talk about Iran. You also helped lay the groundwork for last week's nuclear deal with Iran, a temporary deal. But even some of the president's allies in Congress have been quite critical of the deal, saying it just freezes the Iran program, doesn't cause any rollback. And you see President Rouhani of Iran, in this weekend's Financial Times, say that Iran is absolutely determined to maintain uranium enrichment (inaudible), it's a 100 percent red-line for his government. If they maintain that position, can there be a permanent deal that works with Iran? DONILON: -- maximalist position at this point as we begin the negotiations for a comprehensive agreement. And, no, it's going to have to be rolled back, the Iranian program, for this to have to be a -- for there to be a comprehensive deal at the end of the six-month negotiation. But the interim steps are quite significant and I think positive in this way, they freeze the program in place. They roll back portions of the program, particularly the 20 percent enriched you uranium, which is going to be neutralized. It provides intensive monitoring, including (inaudible) we have monitored before. And it addresses something the Israelis have been very concerned about and we've been concerned about, which is the plutonium-producing reactor at Arak. It's a very good foundation as a backdrop against which to have comprehensive negotiations. I think it's a very solid achievement by Secretary Kerry and President Obama and the administration. And, again, I think a very solid basis on which to go forward. The other thing it does, George, is this, the Israelis and we were concerned that as you open up the negotiations with Iranians, that they would use the pendency of those negotiations to advance their program and stall the negotiations. That's not going to be the case here because everything is frozen in place during the time that negotiations are under way. STEPHANOPOULOS: You know, one of the things we've seen though is that it has created a lot of upset, not only in Israel, but also among some other allies in the Middle East, like Saudi Arabia. And it feeds into a general perception among some of our adversaries, like Vladimir Putin, like the Saudis, that the president has been vacillating and weak. DONILON: Well, I think that the -- I don't see how in this case you can call the president vacillating and weak. I mean, how did we get here with respect to Iran? We got here through a U.S.-led, very tough isolation and pressure campaign. The centerpiece of that campaign were the sanctions. (inaudible) the United States-led sanctions, which have been the toughest put on any country, you wouldn't have had a negotiation under way right now. You wouldn't have forced the choice. You wouldn't have had the election of Rouhani. There is a direct line here between the sanctions, Rouhani's election, and their coming to the table. Why? Because we put tremendous pressure on the Iranian economy. We've also isolated the Iranians politically. And we've had a fairly major defense build-up in the region to indicate to the Iranians that all options are on the table. So, this has been U.S.-led, U.S. pressure campaign to bring the Iranians to the table. The test now is whether or not the Iranians can do the things they need to do to assure the United States and international community they don't have a dangerous program. STEPHANOPOULOS: We're just about out of time. Let me ask one final question about North Korea. We've seen these photos this weekend, Merrill Newman, 85-year-old Korean War veteran detained by the North Koreans. They're basically charging him with war crimes. Is there any way to deal with this country? DONILON: Well, what the North Koreans should do, of course, is release Mr. Newman right now. They have had their political theater and they should release him in the interest of a humanitarian gesture, his health, and the right thing to do. This is an exceedingly difficult regime to deal with going forward. And it presents an ongoing security challenge for the United States, the countries in the region, including China. STEPHANOPOULOS: Tom Donilon, thanks very much. When we come back, the "Roundtable" weighs in on two surprise announcements, one from Pope Francis, one from the president. BARBARA WALTERS, ABC SPECIAL CORRESPONDENT: So you may want to stay in Washington because of Sasha? WALTERS: I don't want to pin you down but I am. STEPHANOPOULOS: And later the growing debate over America's favorite game, is football too dangerous for its own good? STEPHANOPOULOS: Look at this trunk right now that had some Russians seeing red. It's a giant Louis Vuitton in Red Square, supposed to hold a charity exhibition. But after Russian politicians objected to having a monument to capitalist luxury just steps away from Lenin's Tomb, the display was dismantled on Friday. And that came on the heels of a remarkable manifesto on wealth and inequality from Pope Francis this week. Our "Roundtable" is going to discuss that, and a lot more, when we come back. STEPHANOPOULOS: There's Pope Francis this morning at a prayer service in St. Peter's Square, start of this holiday season. And it comes on the heels of a remarkable document he released this week. We're here with the "Roundtable" to discuss that. I want to read some excerpts of it first though. It's called "The Joy of the Gospel." It talks a lot about our duty to the poor. And he comes out against what he calls the "globalization of indifference." He says" "'Thou shalt not' to an economy of exclusion and inequality. Such an economy kills. How can it be that it is not a news item when an elderly homeless person dies of exposure, but it is news when the stock market loses two points?" Takes on trickle-down theory, says: "It has never been confirmed by the facts and expresses a crude and naive trust in the goodness of those wielding economic power." And finally then goes directly into political debates, he says: "I beg the Lord to grant us more politicians who are genuinely disturbed by the state of society, the people, the lives of the poor, it is vital that government leaders and financial leaders take heed and broaden their horizons, working to ensure that all citizens have dignified work, education, and health care." Peggy Noonan, in some ways a summary of all the things we've been seeing from the pope in the last several months. And he didn't necessarily change church doctrine but kind of reordered its priorities. NOONAN: Well, each pope in the way he speaks about the problems of the world shows the world his own thinking and his own sense of priorities. This pope, first of all, he continues to fascinate, he excites the imagination of the world. I have never had so many friends, of various sorts and backgrounds, in this city and in Washington say, I love this man so much, I'm considering becoming Catholic. Have you heard that? I'm actually hearing it from people. NOONAN: They're like, wow, can I join? Here's -- there are many different ways to approach the pope's paper, which is long and which dealt with many things. One of the thoughts I had briefly was this. Our modern popes have tended to be European social democrats. They are -- socialism is not something that has upset them (inaudible). They grew up in a certain world and they grew to understand the economic ways and practices and traditions of the West. The free place, which was helpful to them as they -- they, cardinals who became popes, resisted the Communist world. STEPHANOPOULOS: He seems to be wanting to take some of the heat of the political debates here in the United States as well. I was struck also, Keith Ellison, by -- he seemed to suggest that bishops should not be denying communion to those politicians who support abortion, which has been a big controversy here in the United States. ELLISON: Well, so much of the gospel of holy scripture is about our duty to the poor. The key issues that animate people's lives every day -- can I make enough money to put food on the table? You know, you hear people say, I can't survive on $7.25 as they are standing outside protesting the McDonalds or a Wal-Mart, or you name it. And he's speaking to their reality. And it's so thrilling to hear a faith leader, of any faith, Muslim, Christian, any -- Jewish, talk about the real guts of their values in a way that actually should inform policy. STEPHANOPOULOS: And then, congressman, I wonder if we're seeing -- you know, you see some of this on both the left and the right more generally, a real populist energy. COLE: ...are big fans of the pope. You know, a pope that talks about people being sourpusses. I mean, I love this guy. And I think it's a very helpful message in terms of what our obligations are as individuals. On the other hand, I'm also an Adam Smith Wealth of Nations guy. And I look at capitalism as something that has generated more wealth and changed more lives for the better than any other economic system. But that doesn't mean there's not a place in it to (inaudible), doesn't mean that there's not a humanity that needs to operate within it. And I think the pope is reminded of that. So, I don't see this as (inaudible) the existing system, but I see it as a very useful corrective and a call for us to be better people. PLOUFFE: It's rare, too, I mean, every move this pope has made seems to be a perfect move. It is just rare in today where everything gets criticized. Everything this person has done -- and it is the greatest campaign strategy of all time. COLE: Take some lessons from him about reinvention and inclusion. STEPHANOPOULOS: -- Look at that. We just have about a minute left. I do before we leave, I want to show a little bit of President Obama's interview with Barbara Walters where he suggested he might stay in Washington after leaving office. OBAMA: She'll be in sophomore in high school. BARBARA WALTERS: So you may want to stay in Washington because of Sasha? I don't want to pin you down, but I am. OBAMA: Well, let's put it this way, Sasha will have a big vote, obviously they and Michelle have made a lot of sacrifices on behalf of my cockamamie ideas of running for office. So, I want to make sure that it's good for them. STEPHANOPOULOS: David Plouffe the president being a good father and a good husband right there. Is it realistic that he could be the first president I think since Woodrow Wilson to stay in Washington after? PLOUFFE: Well, you have to do right by your kids. So I think most presidents want to escape Washington at the end of their term. But you've got to do right by your kids. And the way, it's a good thing he won re-election, because he might have had six years in Washington as a former president. NOONAN: Woodrow Wilson stayed in Washington because he was dreadfully ill. He had had a stroke or a series of strokes, and so he was not well, so he moved a few blocks away from the White House. I think we'd all agree, in general, it is very good when the presidents arrive from a real American place, and it's very good when they get their job done to leave and get home, go home to the real American place. As Harry Truman did, as Reagan did. COLE: I'm really glad that the president did that, because that's a part of him that I think Americans need to see. He is a wonderful father. When he was out in Moore, Oklahoma during the tornadoes, we were driving around. We were talking about how difficult it is to be president of the United States. And he made the point, you know, the only good thing about my job is I know neither of my daughters will get in a car with a drunk driver. You know, he thinks about it. It's very endearing. And that's the part of him I like. ELLISON: You know, George, I love it when the president reveals that he's a regular person. He's in an anxiety over some of the issues he's facing right now. And I believe he has the ability and the persistence to push this thing through and help realize the vision that Pope Francis is talking about. STEPHANOPOULOS: We're many years away, three more years left, of course, in the White House. Thank you all, it's a great roundtable. And coming up, did you see this incredible end to last night's Auburn/Alabama game? No time left on the clock, Auburn returns a missed field goal 109 yards -- he's just starting out right there, about to make the turn. Huge upset over the Crimson Tide. Already being called the best finish ever in college football. What a win last night. Auburn fans crowd the field. It comes at a time when football both more popular and facing more questions than ever about safety. We're going to talk about that with our expert panel, the controversy over concussions next. STEPHANOPOULOS: And when we come back, after a record settlement for brain damage to pro football players, is more change on the way in the NFL? Is tackle football too dangerous for kids? Our panel of experts weighs in. UNIDENTIFIED MALE: Bell swings to the outside, helmet goes flying, but he's in for the touchdown! UNIDENTIFIED MALE: I thought he had possession crossing the line. At least, as that helmet was coming off, he took the second blow. STEPHANOPOULOS: With more stories of NFL veterans diagnosed with permanent brain disease, has sparked so many questions about the future of football at a time when the NFL is more popular and profitable than ever. We have a panel of experts ready to take on that debate. First, here's ABC's chief health and medical editor, Dr. Richard Besser, with a closer look at the science, the safety and possible solutions. UNIDENTIFIED MALE: What a hit. DR. RICHARD BESSER, ABC NEWS: Football fans live for brutal blows. Look at James Harrison. UNIDENTIFIED MALE: A very serious hit James Harrison (inaudible). BESSER: Patrick Lewis. Morgan Cox. And that one was a knockout. UNIDENTIFIED MALE: Let's hope that he is OK.
BESSER: But what thrills the fans may be what dooms the sport. Are we looking at the end of football? Memory loss, depression, dementia. Former players like Jim McMahon and Steve Young, along with medical studies are showing that what's good for football in its current form is lethal for the brain. Damaged pros compare symptoms of chronic traumatic encephalopathy, CTE, a degenerative brain disease, and the lasting effects of repeated blows to the head. On ESPN Radio, quarterback Brett Favre says he's losing his memory. BRETT FAVRE, FORMER NFL QUARTERBACK: This was a little shocking that I couldn't remember my daughter playing youth soccer. It was just one summer, I think. BESSER: Former New York Giant Harry Carson says on PBS, he contemplated suicide. HARRY CARSON, FORMER PRO FOOTBALL PLAYER: I was so depressed that I just thought about accelerating and driving through the guardrail and just going over. BESSER: It turns out the future of football may rest on Dr. Ann McKee's scalpel. She is a walking contradiction. A leading neuropathologist who studies CTE and the brains of dead players and is a die-hard Packers fan. In love with the sport that can physically devastate players. She showed me the damaged brains of former athletes, donated for her research. DR. ANN MCKEE, CENTER FOR THE STUDY OF CTE: You get spots, spots, spots, that's really typical of this disease. BESSER: Alzheimer's doesn't look like this? I see tragic stories under the microscope, I see kids who have died in their teens with the early stages of this disease. It's really quite unsettling. BESSER: The question that I face as a pediatrician, and when my own sons wanted to play football, is the danger of concussions so high that doctors and parents should forbid it, can this sport be saved? MCKEE: I don't know. I just don't know. BESSER: I went to a practice in the heart of football country, Athens, Georgia. One of the many places football players barely come up to my knees. UNIDENTIFIED FEMALE: Oddly enough, we're coming in kind of late. BESSER: 7 late to start? UNIDENTIFIED FEMALE: Oh, yeah, that's what I said too. UNIDENTIFIED FEMALE: So, midgets start at 4. A few weeks ago, the nation's largest youth program, Pop Warner, announced that participation dropped about 10 percent between 2010 and 2012. Are parents scared for their kids safety? I want to hear a strong argument in support of the game, and who better to give it than college coach at the University of Georgia, Mark Richt. Plain-speaking, stoic, and a father of four. You have to wonder, is it a safe sport for our country? BESSER: But his own team, along with several others, is doing concussion research, right on the field. You'll see it on the screen. BESSER: If I give it a hit. BESSER: Using cutting-edge devices that may identify the forces that cause concussions so they can prevent them, might help. Coach Richt supports the research. RICHT: I think all these things that are being designed to help us understand more about concussions and those types of injuries, I think the better off we're going to be. BESSER: But Ron Courson tells me the keys are education and independence. If he thinks a player needs to sit out, the player is out. Regardless of what the coach thinks. RON COURSON, SR. ASSOCIATE ATHLETIC DIRECTOR, UNIVERSITY OF GEORGIA: We sit down with every athlete in every sport, and the first thing you hear, and talk about what the signs and symptoms are of concussion. So if they (inaudible), then come seek help. BESSER: Have you seen any change over time in players reporting a concussion or the signs of a concussion on their own? COURSON: A great example last year, in the fall, Georgia football, we had nine concussions. Five of them self-reported. BESSER: Then I talked to some of the players. If you had a concussion, would you pull yourself out of the game? UNIDENTIFIED MALE: If I had a concussion, probably not. BESSER: You would play through it. UNIDENTIFIED MALE: My first day of football, you are going to be guaranteed three concussions, but we're going to pay for five years of your school and you're going to get how many ever degrees or whatever. I'm saying, absolutely. UNIDENTIFIED MALE: For three concussions? That's not a bad deal at all. STEPHANOPOULOS: And Dr. Besser joins us now along with Joe DeLamielleure, an NFL hall of famer from the Buffalo Bill. Mark Fainaru-Wada, investigative reporter from ESPN, co-author of "League of Denial," and USA Today columnist, ABC News contributor Christine Brennan. Welcome to you all. Let me begin with you. You are wearing that Hall of Fame jacket, and I saw your Hall of Fame speech. It was clear when you were giving that speech, football was what you always wanted to do, always wanted to play. But now you've been diagnosed with CTE, and you say you are part of the forgotten generation of football players. Do you feel betrayed by the NFL? JOE DELAMIELLEURE, BUFFALO BILLS: I feel betrayed by the NFL and the union, because we have no health insurance. That's a problem. For the guys who played before '93, we have sub-poverty pensions, and no health insurance. That's a problem. STEPHANOPOULOS: Even though there has been now this multimillion-dollar settlement, $765 billion settlement designed to help players who have been injured. STEPHANOPOULOS: You really do make the point. These pre-'93 guys, you're talking a completely different world in terms of pay. DELAMIELLEURE: I was the No. 1 pick. My salary was $22,000, $24,000, $26,000, $28,000, $30,000. Nothing guaranteed. DELAMIELLEURE: Yes. Here is the problem. We played on natural turf that was torn up. There is no head (inaudible), so I got 68 percent hearing loss in my left ear. There's no more chop blocks, there's no more wedge. It used to be called the suicide squad, the special teams. They even changed that to the special teams. STEPHANOPOULOS: And Mark, you have done a lot of work, of course, looking at the league and how the league dealt with all of this, even this settlement, not going to go far enough for so many of the players? MARK FAINARU-WADA, REPORTER, ESPN: I think there are real questions. We're talking about $765 million. And I think some of the reporting that Steve, my brother and I, have done on this issue are real questions about whether there's even enough money there. You got a lot of players suffering as we've done the reporting on this, and a number of players wondering really whether in the end is the money going to step up, are there going to be players who decide that they're going to opt out of the settlement, because there's not enough? A lot of these guys feel very betrayed by the league's denial for two decades. And we sort of tracked the trajectory of that in the book, and I think now, as they try to get information about this settlement, it's really hard to come by, you have got lawyers and players who are really frustrated, not getting any answers. Despite the announcement of a big settlement prior to the season starting, and we're now in week 12, and there are virtually no details about this settlement at this point. STEPHANOPOULOS: And Christine, everyone waiting for evidence to show how much the league really knew or should have known for so long? BRENNAN: Brett Favre, exactly, and I think what we're seeing here, is the fact that this story is not going away, and it will continue to be a part of our conversation, as it should be, I think. STEPHANOPOULOS: And there's only about $10 million in this for research. It's pretty hard to deny the basic facts, though. BESSER: You know, the concern I have is that in that settlement, there's no admission that there is a problem with football. And if there's no admission of that, and you're only putting $10 million into research, how are you going to know whether this sport could be made safe enough? That we would still want to watch it, but it would not do this? And what about below the NFL level, as we're seeing in the piece, these kids playing in college ball aren't going to own up that they've had a concussion. They're going to go out there and have it. And if that's happening time and time again, are they going to be experiencing the same thing that the pro players are? STEPHANOPOULOS: And your son played college ball as well at Duke, are there any changes in the game that could sort of solve the riddle that Rich is talking about, that make it something we'd still want to watch but make it safer? DELAMIELLEURE: I think there's tremendous changes in the game. Just what I told you, no Astroturf, no head slaps. There's a lot of rule changes for the better of the game. So, I think they're doing the right thing, but for them to continue to do the right thing, they have to make it better for the guys who created this monstrosity of a league, and they just don't do it. So they're always getting negative. There's something good comes out, then there's negative that comes out with it. STEPHANOPOULOS: Think the NFL is ready to go farther? FAINARU-WADE: Well, I think the question -- I mean, I think there are two issues. There's the league itself and the NFL and what NFL football is going to look like. And I'm -- frankly, and Steve and I have said this, I don't think (INAUDIBLE) want the sport to change. It's a brutal, violent sport. That's one of the appeals about it. STEPHANOPOULOS: And everybody was gripped all weekend watching the games. FAINARU-WADE: Right. We were all talking before the game about that Auburn finish. I mean, so, you know, the sport is what it is. This is the sport. But you did have, for two decades, I mean, what did the NFL know and when? I think we really traced that in the book, frankly. They have known for two decades this issue is there. And while the commissioner and the league are making moves forward on this issue in terms of rule changes that they're trying to mitigate, at the same time, when the commissioner is asked now, is there a link between football and brain damage? He says, well, we're going to let the doctors decide this. STEPHANOPOULOS: ... wants to do right by the players? BRENNAN: I do, yes. Roger Goodell is in his mid-50s. He has daughters who play lacrosse. And let's face the facts here that, yes, we're talking football, but if you say, OK, let's move my boy or my girl out of that sport, soccer, girl's soccer, the risk is huge. Any sport where girls and boys play at an equal level, George, so whether it's soccer, ice hockey, baseball, softball, girls are much more likely to have concussions than boys. And that risk is there. So you leave football? We say, OK, we're done with football. Well, then the risk exists in so many other sports. But I do think there is a question. What will football look like 20, 30 years from now? And the answer is, of course, we don't know. STEPHANOPOULOS: We don't know. I'm afraid we're going to have to end it there. Thank you all very much. We're going to be right back with Bono, the U2 superstar has been raising his voice in the battle against AIDS for a generation. On this 25th anniversary World AIDS Day, he has the startling message of hope. That's next. STEPHANOPOULOS: That red ribbon on the North Lawn of the White House marks today's 25th anniversary of World AIDS Day. And in those 25 years, billions have been spent on the fight against AIDS (inaudible) raised with the help of Bono from U2 and an army of activists. Just this week the U2 star helped raise $26 million in an auction for the (RED) campaign at Sotheby's. And that's where we sat down for "Sunday Spotlight," to discuss a goal that once seemed unthinkable, a world without AIDS. STEPHANOPOULOS: World AIDS Day 2013, and the end truly is in sight. BONO, MUSICIAN, ACTIVIST: Yes, it really is. There's jeopardy. But it really is. It does seem to be the political will, the American people have said that this fight against HIV/AIDS, this tiny little virus that has wreaked so much havoc in so many people's lives, 34 million dead, they want it (inaudible). They want to see it done. And that is so inspiring to me. STEPHANOPOULOS (voice-over): In a rare display of bipartisanship, Republicans and Democrats came together last month to fund PEPFAR, an American program started by President Bush. BONO: We argued with President Bush about setting up PEPFAR. We thought, why not stick with the Global Fund? And he (inaudible) do it ourselves. It was, America is going to do this properly, want to be able to keep an eye on it. And we sort of disagreed with him on that. But actually they work very well together. And even though (inaudible), Republicans, historically, supported PEPFAR, and Democrats the Global Fund. That has changed. And so actually we found ourselves with Democrats going in, saying, what about support for the Global Fund? And they were like, but that part is doing so well. And it's like, wow, this is incredible. This is what happens when people put their ego and political point-scoring away for a bigger purpose and they stop playing politics. STEPHANOPOULOS (on camera): The closer you get to the finish line the more difficult it can be. BONO: We're very worried about complacency. There's a chance of having the first AIDS-free generation by 2015, 2016. We can see it. We could lose that if we lose the political will. STEPHANOPOULOS (voice-over): So, a new battle has begun to keep up the stunning progress in a fight that at one point seemed lost, back when life-saving drugs were out of reach for millions. BONO: They used to cost a fortune, you know, 10 grand a year. It's down to 40 cents a day for one pill. I mean, we forget how dramatic it was here in the United States and in Europe. STEPHANOPOULOS: And then when you go to Africa, you go to India, there was a concern, not too long ago, that an entire generation would be wiped out. BONO: I remember being in Malawi, in Lilongwe, where there was four to a bed, queuing up to be diagnosed. But the diagnosis was a death sentence because there was no treatment. They had the medication but they didn't -- they couldn't give it to them, they couldn't afford it. And it actually really was sort of an assault on the whole idea of equality. I just thought an accident of where you live, you know, cannot decide whether you live. That is something I'm ready to put my life on the line for that. We can't have these technologies, simple, cheap, and be denying them to others. And we haven't. It's amazing. And it has happened now. And as even I think about it, it's too much. I'm so excited. STEPHANOPOULOS: Progress is so stunning. Our thanks to Bono for that. Some welcome news from Afghanistan this week as well. The Pentagon did not announce any deaths of service members overseas. That's all for us today. Thanks for sharing part of your Thanksgiving weekend with us. Check out "World News with David Muir" tonight, and I'll see you tomorrow on "GMA."